McGeorge Bundy, brother of William Bundy, served as National Security Advisor to Presidents Kennedy and Johnson from 1961 to 1966. Here he discusses the Vietnam war under both Presidents, specifically addressing the Tonkin Gulf Incident, and the attack on Pleiku Airbase while he was in Vietnam. He also recounts events around the 1965 decision to increase American troops in Vietnam, and a 1968 meeting of the Wise Men where Johnson called in former administration officials for their advice on troop levels and bombing strategies. 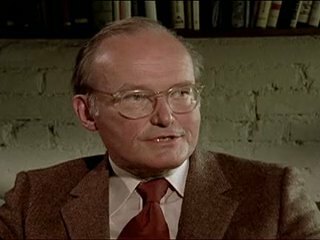 Chicago: “Vietnam: A Television History; Interview with McGeorge Bundy,” WGBH Media Library & Archives, accessed April 19, 2019, http://openvault.wgbh.org/catalog/V_088AD9C6C6714E5CBFBD9C7ACC602660. MLA: “Vietnam: A Television History; Interview with McGeorge Bundy.” WGBH Media Library & Archives. Web. April 19, 2019. <http://openvault.wgbh.org/catalog/V_088AD9C6C6714E5CBFBD9C7ACC602660>.